Children are welcomed everywhere with a variety of daytime experiences for families to choose from including waterparks, boat trips, watersports, sealife centres and zoos. In the evening, when the temperature cools a little, families of all ages are welcomed at most restaurants. Karaoke bars and clubs that welcome under 16's are open early in the evening. Western Waterpark, Magaluf Western Waterpark offers fun for the whole family. Discover the 'Tornado' where you will be whirled by the power of the water and then thrown down into a swimming pool. Alternatively the children will love the unique adventure of 'Dragoland'. Relax in the 'Congo River' or the big swimming pool. Apart from all this the park has a choice of places to eat, a shop, free parking, taxi and bus services and go-kart racing track. Marineland, Calvia The Bottlenose Dolphins and Sea lion exhibition shows are famous worldwide. The park is full of fun and attractions including sharks, a tropical fish aquarium, a parrot show, penguins, flamingos, monkeys, an aviary and reptile house. There is also a Polynesian garden and Pearl Diving, children's miniature train, pirate boat, jumping castle and ball park, beach, cafeteria and picnic area, plus an environmental education department. Golf Fantasia, Palma Nova Golf Fantasia is a green paradise set in the heart of Palma Nova. With three 18 hole putting courses set amid sparkling water falls, streams and mysterious caves - all located in lush tropical gardens. This attraction becomes very popular during the high season. Go Karting, Alcudia All children (and adults too!) can enjoy racing around the track and pretending to be Lewis Hamilton or Jensen Button. Try your hand at this exciting sport at Karting Mania in Puerto Alcudia. Auto-Safari, Cala Milor Majorca's only zoo consists of a 4km drive through open countryside, passing giraffes, zebra, flamingos and deer (keep your car windows shut against marauding monkeys), followed by a 'baby zoo' with elephants, crocodiles and various young animals. You can also explore the 44 hectare reserve by a special 'mini-train'. 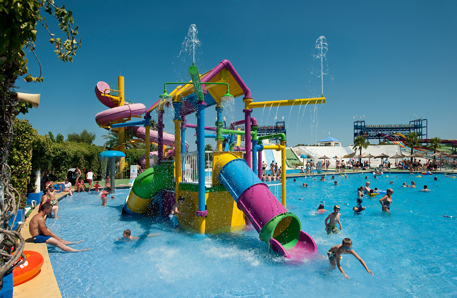 Hidropark, Alcudia A water based theme park with activities for young children. From giant water slides to numerous swimming and boating pools the kids will never get bored. The park offers a variety of flumes, slides and pools for all ages including kamikaze slides, a wave pool, euro bungee, mini go-karts and mini motor boats. A great day out for all the family. There are plenty of fast food type restaurants. There is also a 54 hole 'super-crazy-golf' course next door accessible from both in and out of the park. Horse Riding, Alcudia The western ranch Ranxo Ses Roques situated in Alcudia is the perfect place to ride horses and ponies, for adults and children, in a natural preserved territory. A family run western ranch it's open from April until the end of October. They have horses for beginners and experienced. Enjoy the unique landscape of Majorca on horseback. Aqualand, El Arenal, Palma Aqualand is a place for the whole family to enjoy, there are plenty of different shapes and sizes of slides for everyone, making this is an ideal place for a great family day out. Ranxo Ses Roques Ranxo Ses Roques is located in Alcudia and offers excursions on horses and ponies that take you around the bottom of the mountain and countryside. Ther are also excursions that take you to the top of the mountain where you can see the bay of Alcudia. There is an animal farm where you will find various animals such as goats, ducks, peacocks, turkeys, cows, rabbits, donkeys and piglets for all the family to enjoy.